When a new Brand needs to be set up in Enterprise Server, making a copy of the structure of an existing Brand can save a lot of time. Step 1. Access the Brands Maintenance page. 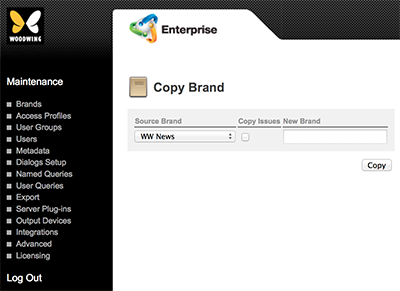 The Copy Brand page appears. Step 3. From the Source Brand list, choose the Brand that needs to be copied. Step 4. (Optional) To also copy the Issues of the Brand, select the Copy Issues check box. Step 5. In the New Brand box, enter a name for the new Brand. 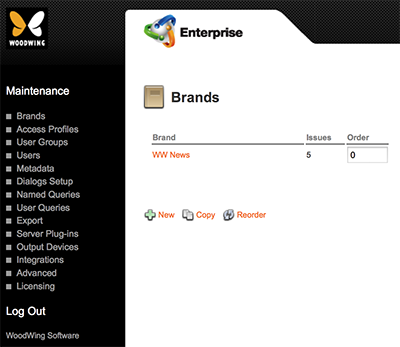 The Brands page appears again with the newly-created Brand displayed in the list.